The red grape variety comes from France. Synonyms are grouped alphabetically by country Mourvèdre d'Afrique ( Algeria ); Napa Gamay Australia. Brazil ); Aramon du Sud-Ouest, Brocol Venant, Cahors, Cot de Cheragas, Folle Noire, Gros Auxerrois, Jan Pierrou, Moutet, Noir de Chartres, Plant de Cros, Plant du Midi, Quercy, Valdiguer, Valdiguier, Venant du Lot ( France ); Napa Gamay, Gamay 15 ( California ). 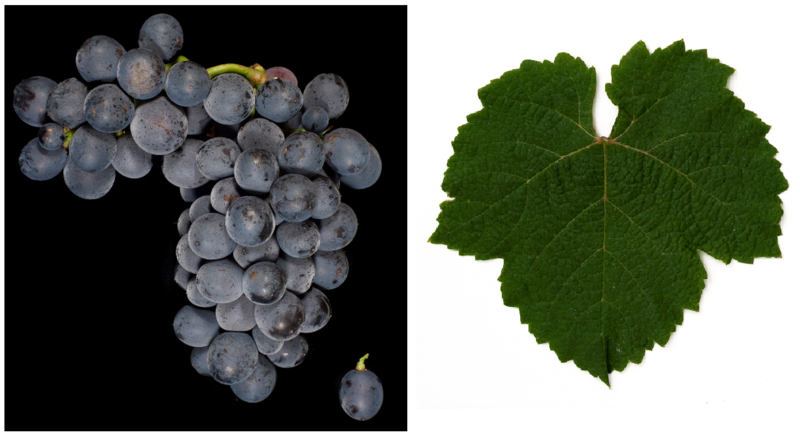 It may, despite seemingly suggestive synonyms or morphological Similarities do not match the varieties Cot (with synonyms Cahors, Noir de Chartres), Gamay or Monastrell (Mourvèdre) be confused. During the US prohibition (1920-1933) she was in California under the name Napa Gamay very popular and occupied end of the 1990s still about 2,500 hectares. The true identity of the variety was first discovered in 1980 by Pierre Galet. Here, too, the stock has drastically reduced to 134 hectares. Small stocks are also available in the US states Oregon and Indiana as in Brazil (4 ha). In 2010, a total of 272 hectares of vineyards were reported (Statistics Kym Anderson ). This page was last modified at 26 December 2018 at 09:27.